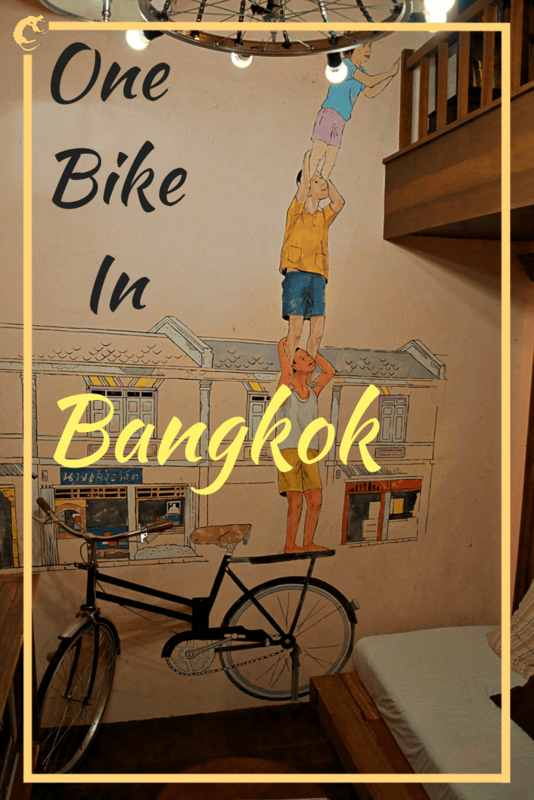 If you have ever considered coming to Thailand you have probably seen the highlights of Bangkok like the temples (Wat Phra Kaew, Wat Pho, Grand Palace, Wat Arun) or markets (Chatuchak market or Taling Chan Floating Market) or the backpacker haven of Khao San Road but how is the biking? Bangkok is busy. It gets 21 million overnight visitors a year (more than London) and the scenes of scooters zipping through traffic are absolutely accurate. On top of that, they drive on the wrong side of the road (certainly not the right). 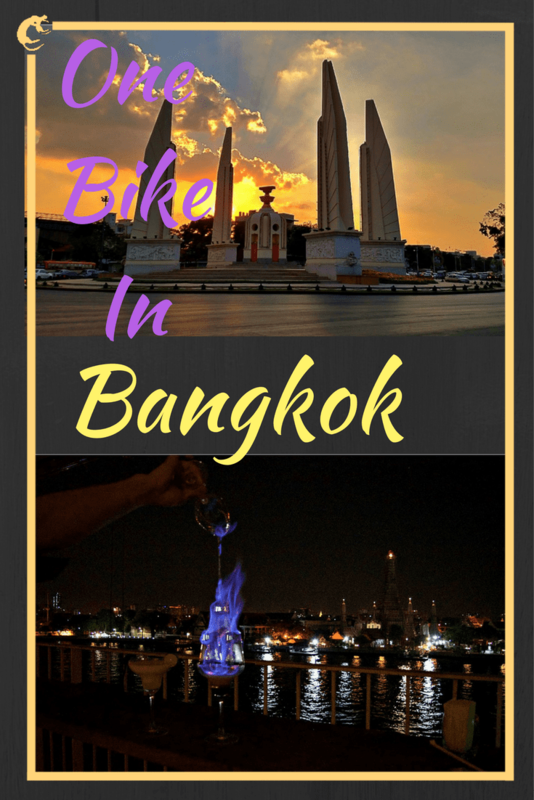 You know how the song goes, “One night in Bangkok makes a hard man humble, not much between you and getting hit in the street.” Have no fear, we found a bike themed trip to the old capital that will keep you entertained and safe if you’re just staying for the night or launching an epic tour of Thailand. You know what I’m hawking here. If you’re visiting a nation’s capital, you ought to have some context. Before Thailand, there was Siam which we’ll start with the Ayutthaya Period (1351-1767). 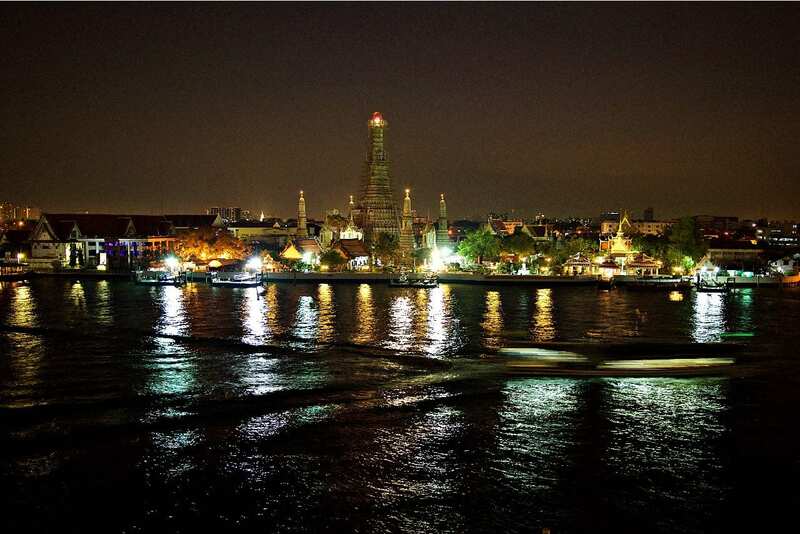 During this time, the kingdom was centered in Ayutthaya, which is about 50 miles north of Bangkok. Notable features of this period are the establishment of Theravada Buddhism as the official religion as the compilation of the Dharmasatra, a legal code based on Hindu sources and traditional Thai custom. 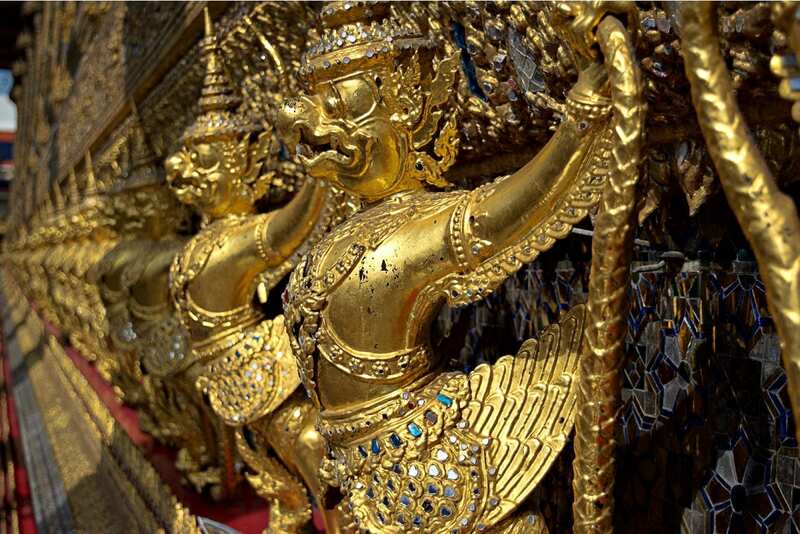 Early Siam was a merging of Buddhist, Hindu and Thai religions and customs as well as a dedication to enlightened leadership. 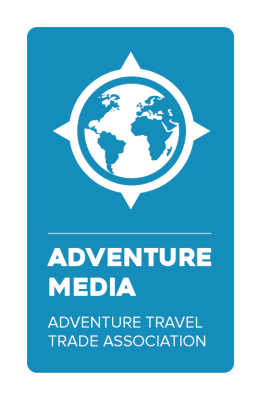 Ayutthaya was a powerful and influential city until it was sacked by the Burmese in 1767. 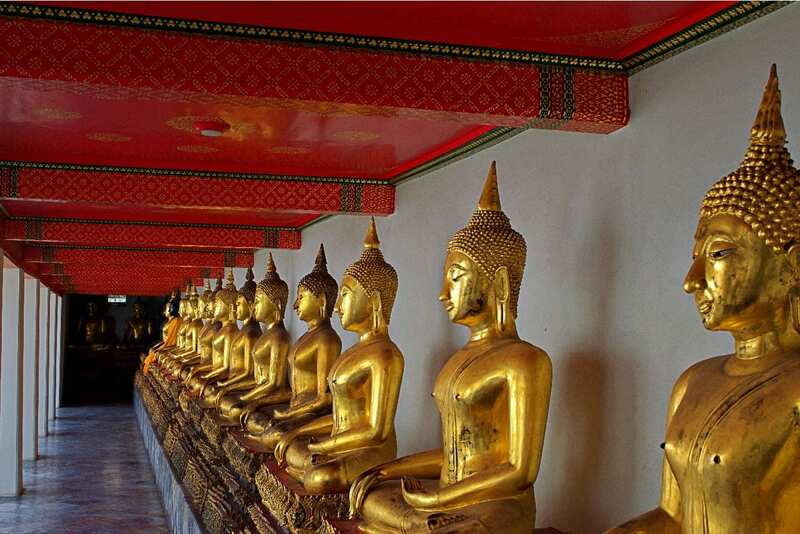 Today, it’s a series of ruins that make a fantastic day trip from Bangkok. The Burmese sacked the capital and killed the entire royal line. 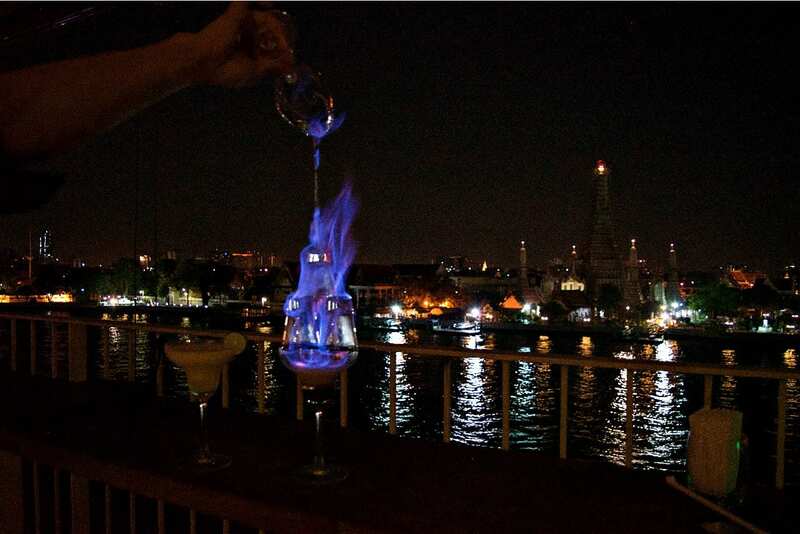 This marked the beginning of the Thonburi Period. Taksin the Great (of Chinese decent) beat back the Burmese and re-established a new capital in the south of Thailand on the west bank of the Chao Phraya near modern day Bangkok. For about 20 years there was a series of unification wars and coups that followed behind the power void left by the retreating Burmese. The final coup was led by General Chakri, who in 1782 succeeded Taksin. Thus, began the Chakri Dynasty. 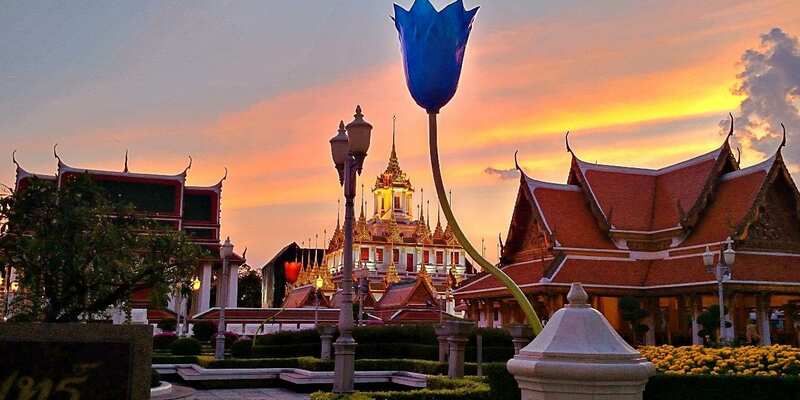 General Chakri was crowned Rama I and moved the capital to Rattanakosin, an island in the Chao Phraya and what is commonly known as old Bangkok. 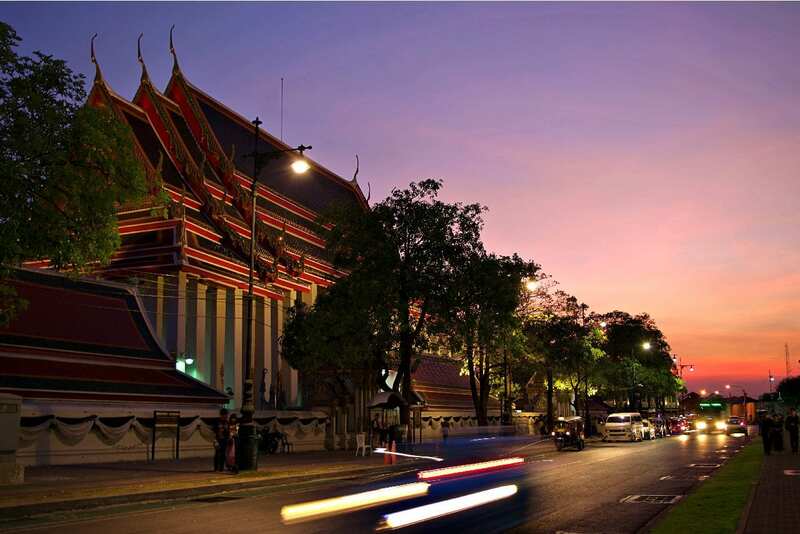 Even though the kingdom of Siam is 800 years old, Bangkok has only been the capital city for about 200 years. The Chakri kings were cognizant of Europe and freely used European influences in their architecture and city planning. Rattanakosin Island was ethnically Chinese before the decision to relocate the capital there, so Bangkok architecture has a stronger Chinese influence than one might see elsewhere in Thailand. It is this mix of the new and the old, of the east and the west that makes Bangkok unique in the world. The Old Capital Bike in is cute from the street but wait till you see what’s inside. 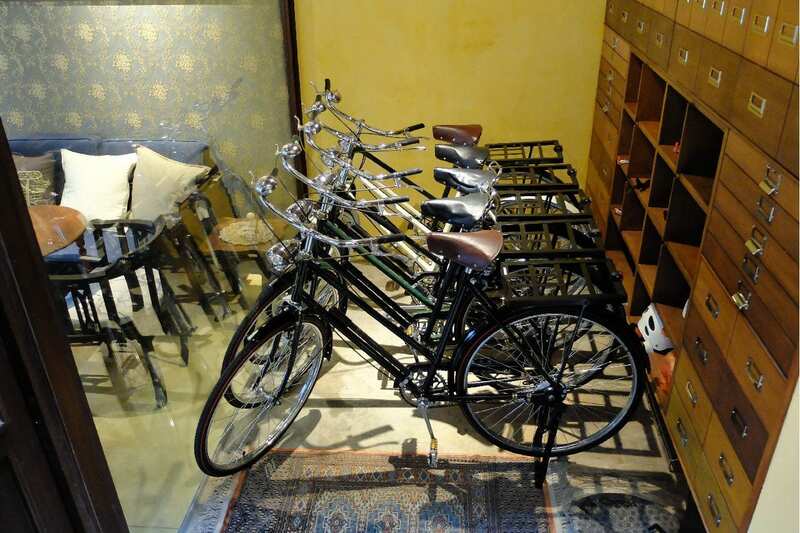 They incorporated a vintage bike theme into a heritage inn. 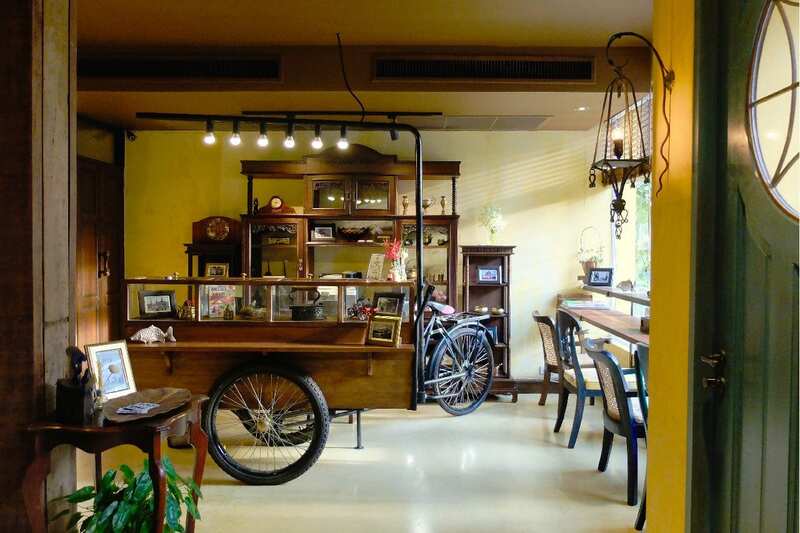 You can relive the past with with vintage bikes and refurbished classic decor. Our best Concierge desk in Thailand. From here they guided us through the maze of old Bangkok. 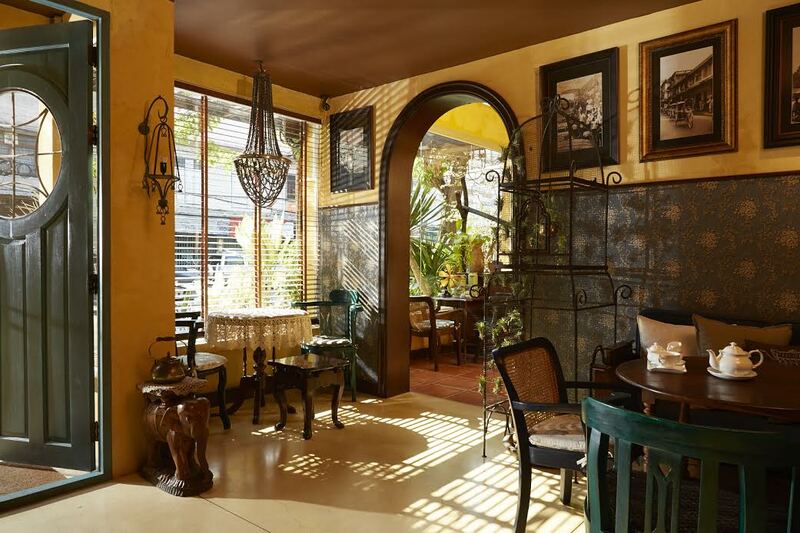 We savored every meal and enjoyed every stroll they recommended. You have to stop in and say hi. 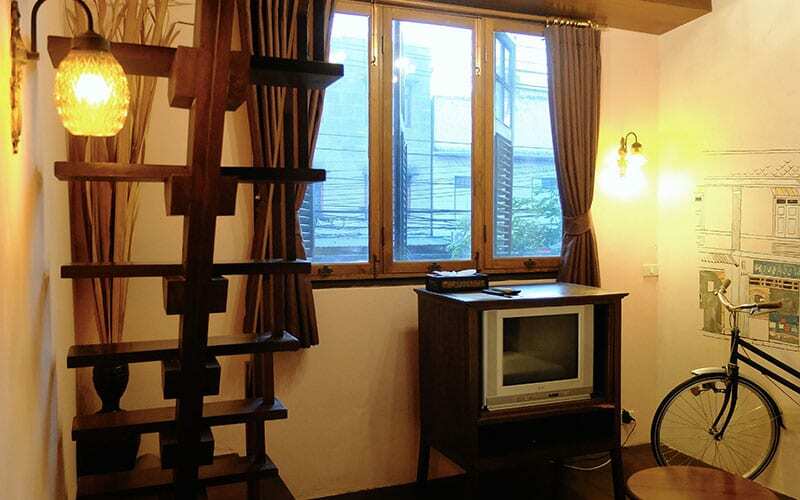 We were greeted with unique heirloom furniture as well as playful wall pictures depicting life in old Bangkok. Our favorite was King Rama IX sitting watching a movie with Elvis. 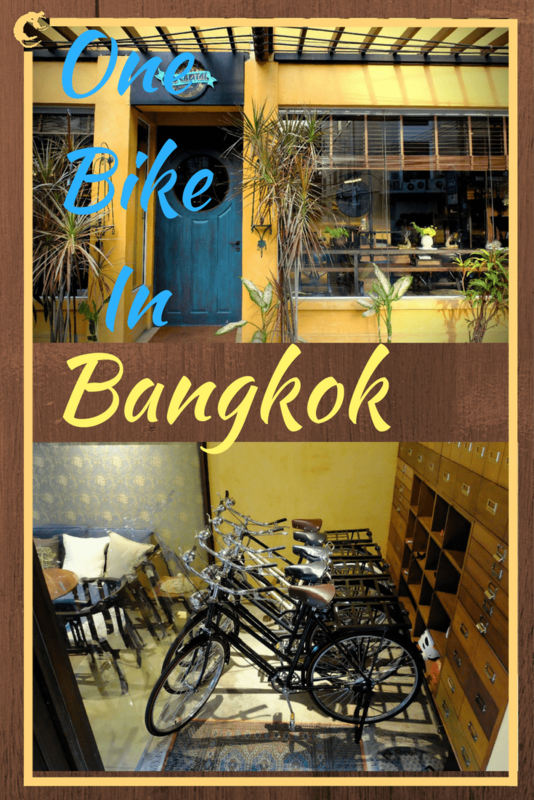 They offer free bike rentals and free night bike tours as well just so you can discover more of the ‘unseen’ old Bangkok. The bikes were in great repair too. Our room was cute and functional, like the hotel. Take this TV. Even though it looks vintage, it was wi-fi equipped so we could take advantage of our fast internet. Up from living room was our loft bed. It felt a little like a ski cabin for some reason. It’s all downhill from here. 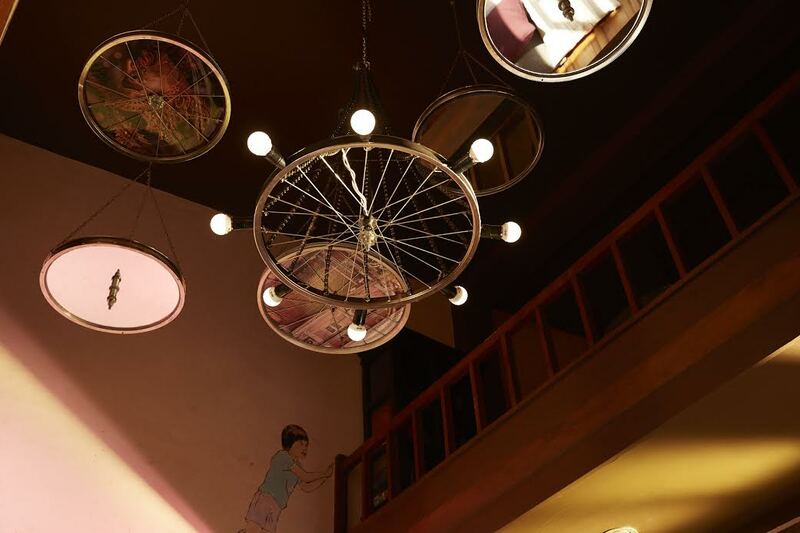 We were loving the wall art and how about that half bike in the wall? I wonder if we could get one of those for home. 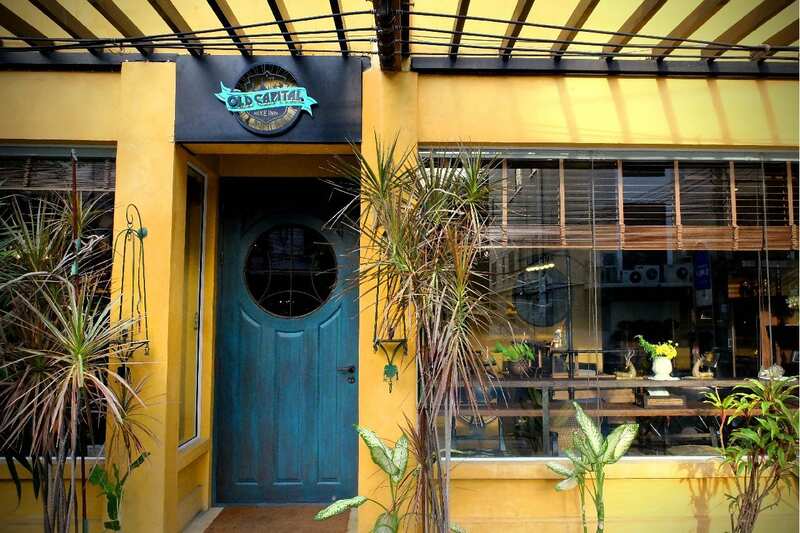 The dining options in Bangkok are limitless and we found three gems within walking distance from the Inn. For dinner our first night, we enjoyed amazing crab curry at the award winning Krua Apsorn. You would never guess it from the outside or the inside for that matter, but this place was outstanding. After dinner, we walked to the Sala Rattanakosin Hotel. Their upscale restaurant and bar offered rooftop dining with amazing views. 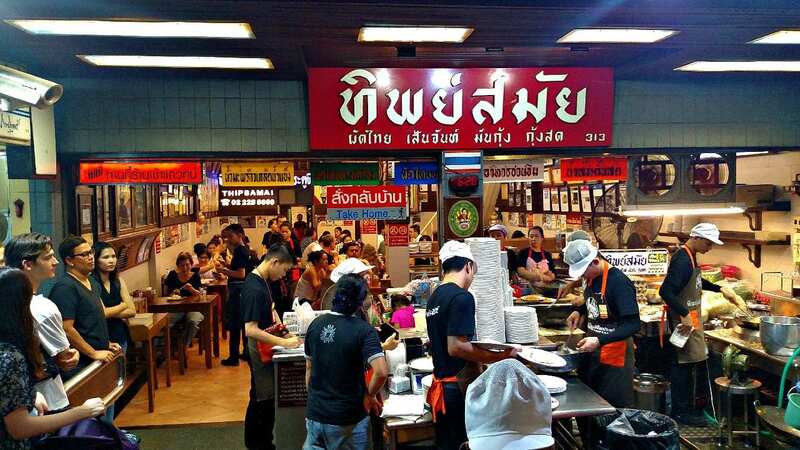 For our second night, we had to try Thipsamai, reported to be the best Pad Thai in Thailand. The line was crazy but it went quickly and the Pad Thai was worth the wait. We ordered the special – Pad Thai cooked in an omelet. 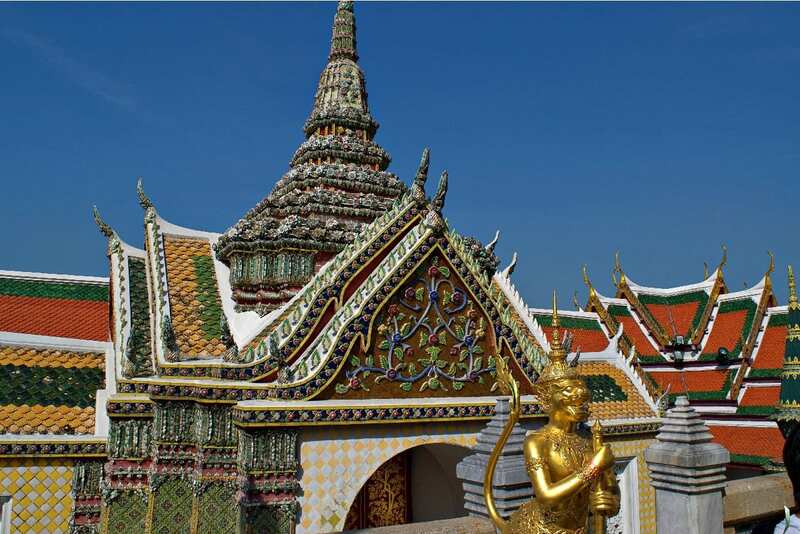 Bangkok temples are built on the theory that more is more and bigger is better. You have the biggest reclining Buddha and Jade Buddha and more spires than you can shake a stick at. On the downside, they are not set in stunning limestone cliffs or at the top of a mountain. They are here because the people are here. Lots of people are here. 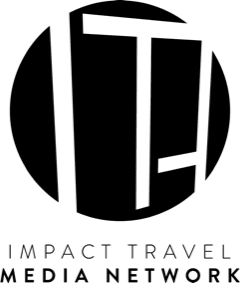 Not so much Thai people and believers whom fill the air with chants, ringing gongs and a feeling of reverence but western tourists. 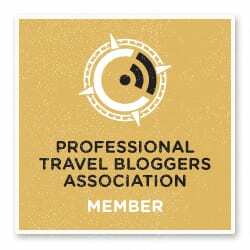 These are obligatory tourist destinations, always on the ‘must see’ Bangkok lists. Don’t judge all Thai temples from this one sample, I believe there is a Thai temple to suit all tastes. We’ll let the pictures speak for themselves. 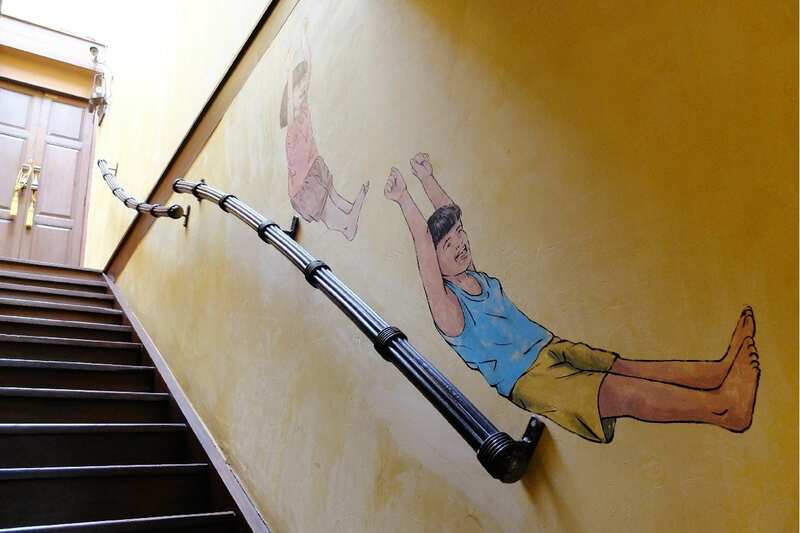 A school for traditional medicine and massage was established at Wat Pho in 1955, and now offers four courses in Thai medicine: Thai pharmacy, Thai medical practice, Thai midwifery, and Thai massage. 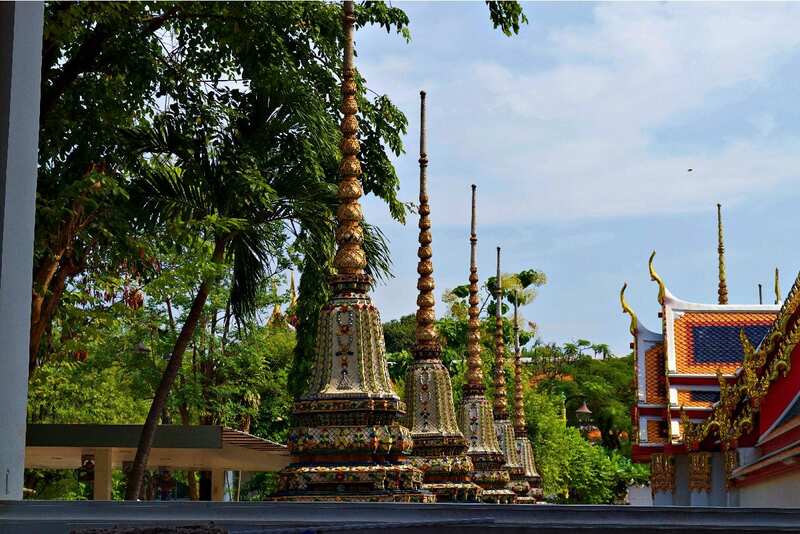 The temple grounds contain 91 small chedis (stupas or mounds). 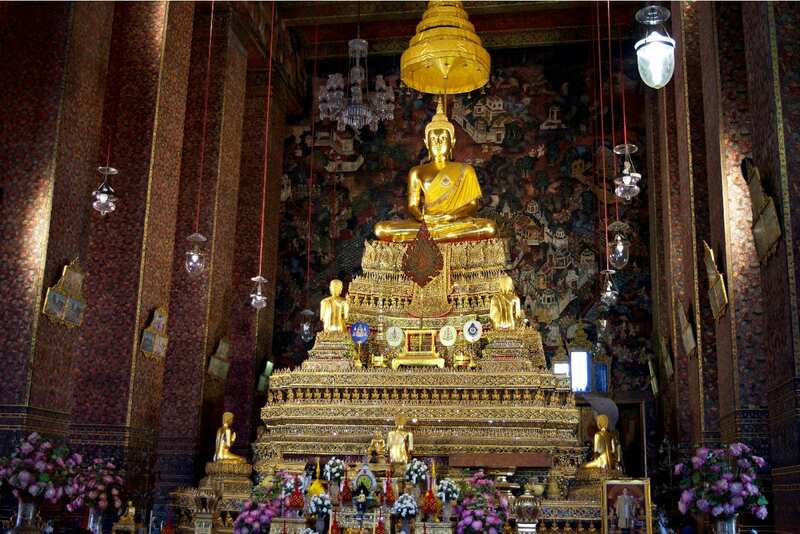 Inside the ubosot is a gold and crystal three-tiered pedestal topped with a gilded Buddha made of a gold-copper alloy, and over the statue is a nine-tiered umbrella representing the authority of Thailand. 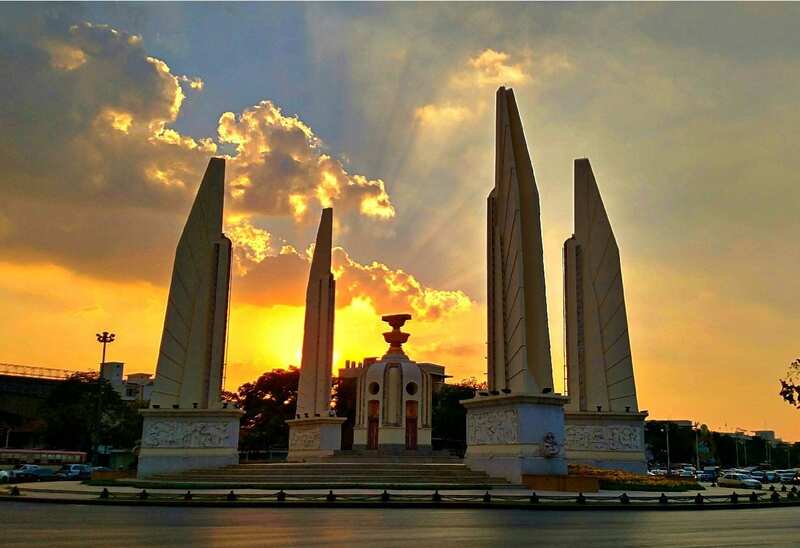 Rama IV placed some ashes of Rama I under the pedestal of the Buddha image so that the public may pay homage to both Rama I and the Buddha at the same time. This double cloister contains around 400 images of Buddha from northern Thailand. Wat Pho in many ways was a collection site for the damaged and abandoned temples after the Burmese war in the late 1700’s and a validation of Bangkok as the new capital. 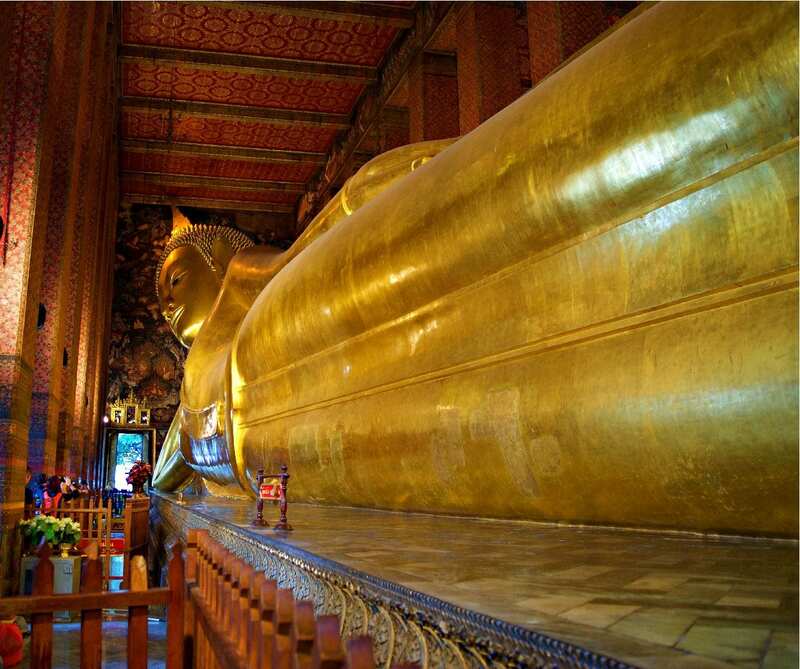 Wat Pho houses an enormous 46m long reclining Buddha. The iconography represents the historical Buddha during his last illness when he is about to enter the parinirvana. The statues of Krut battling naga serpent are a Thai Buddhist adaptation of Garuda in Wat Phra Kaeo. 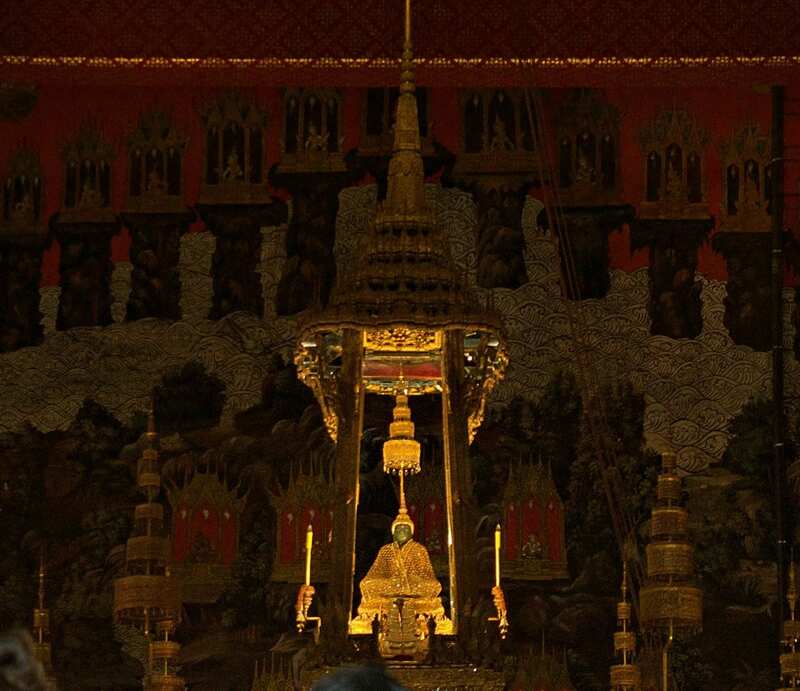 The Emerald Buddha sits inside of Wat Phra Kaew but it long predates Bangkok and even the history of Thai I provided. 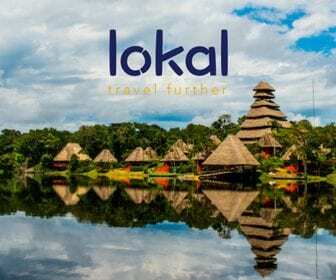 Dating from the 1400’s is has sat in many places including Angkor Wat and Sri Lanka. It is carved from a single piece of jade. 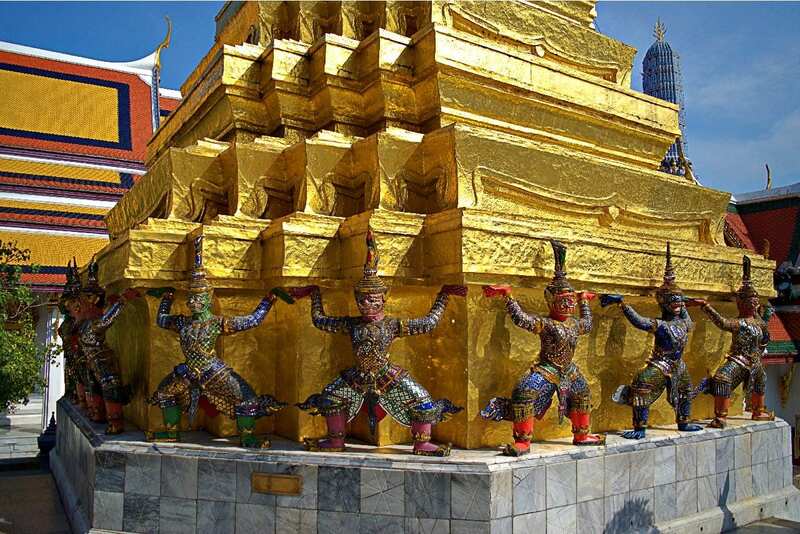 There are two Golden Chedis to the east of the Royal Pantheon. They were built by King Rama I. for his father (the southern one) and his mother (the northern one). The square, tiered base has redented corners. The unusual feature of these chedis are the monkeys and giants from the Ramakien supporting the structure. 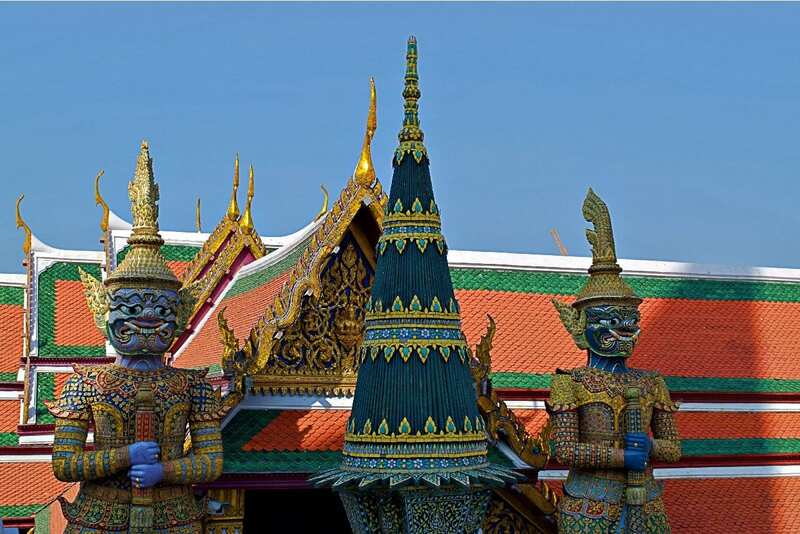 The Grand Palace is home to many ornate temples. In the foreground sits a Kinare – mythological creature, half bird, half man. 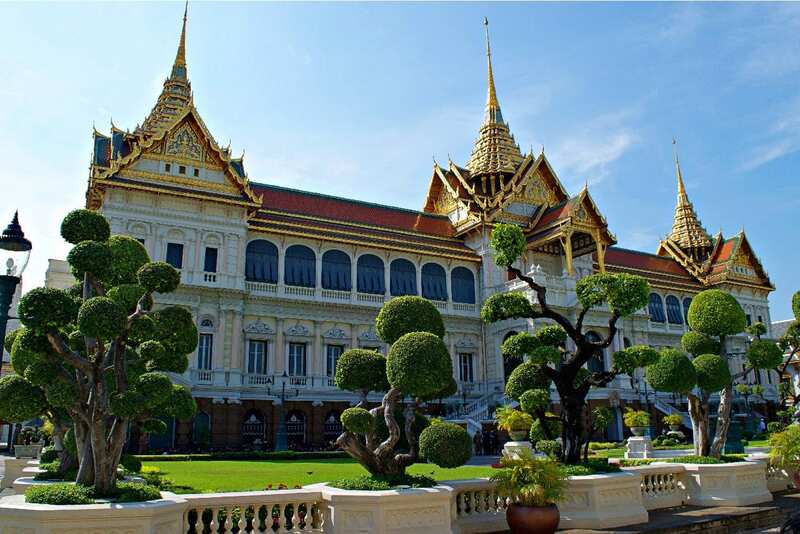 Rather than being a single structure, the Grand Palace is made up of numerous buildings, halls, pavilions set around open lawns, gardens and courtyards. Its asymmetry and eclectic styles are due to its organic development, with additions and rebuilding being made by successive reigning kings over 200 years of history. This one was designed to look like Versailles. Even from the street, the temples and Grand Palace are beautiful. They are lit at night with tuk-tuks zipping by. We took a walking night tour and a night bike ride through here. The night tour was our highlight of Bangkok. The heat of the day ebbed and a layer of peace and stillness settled in the city. Sunsets blended with gilded temples and vibrant lights to create a surreal scene. We felt safe, either when walking or biking but it certainly helped that Jason knew the back ways through the city. He also gave us that local tour guide experience we love. Did you know there is a street in Bangkok dedicated to Buddha shops where people go to buy a statue to donate to their local temple? We heard the story as we biked by the Buddha shops near the Giant Swing. 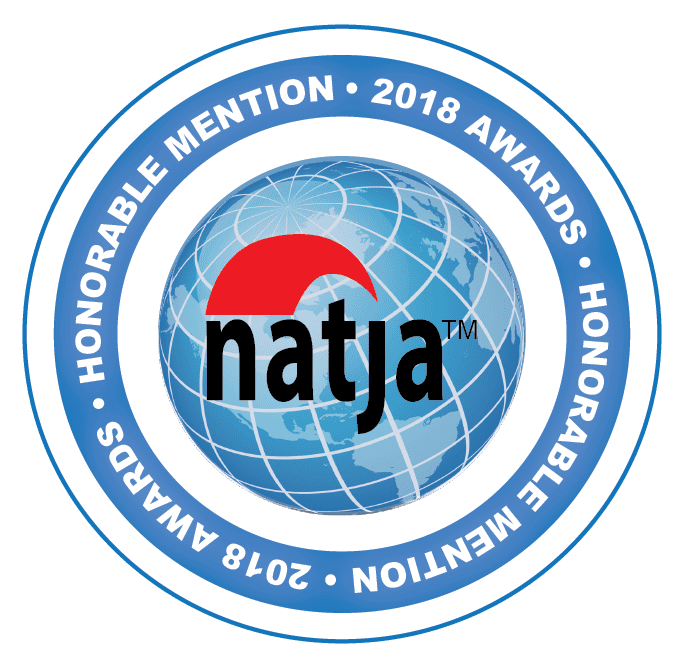 Have you heard of Sepak takraw? It’s a sport similar to volleyball but played like soccer. You use anything but your hands to serve the ball back over the net. We stopped watched a game in a small park and they even offered for to let the kids join in. Perhaps the most interesting story was the Tiger God Shrine. Here, people bring offerings of raw meat for the tiger spirit to grant them fertility. Apparently, a tiger ate a woman’s child here but felt so guilty, he offers the gift of fertility for atonement. You would have never guessed just walking by. It was wonderful to see real life in the city and not just hordes of western tourists meandering through the obligatory sites. Now you know that Bangkok is a relatively new city in an ancient land. Rama I drove out the Burmese and established the city about 200 years ago on Rattanakosin Island. 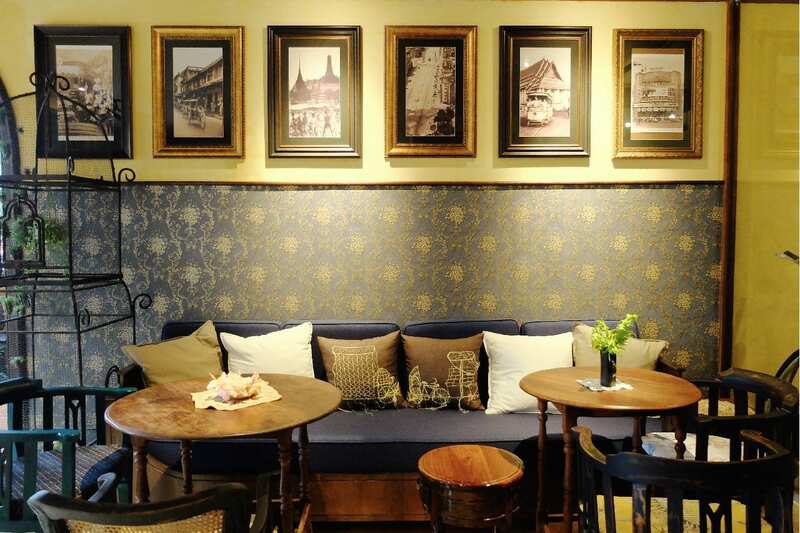 If you want to see the classic sites of The Grand Palace and Wat Pho, we recommend staying on Rattanakosin. You’ll have a chance to walk (or bike) through the old capital in the quiet times when the heat of the day has passed and the throngs of tourists have departed. We loved our stay with the Old Capital Bike Inn with their friendly staff, convenient location, and cute vintage vibe and decor. 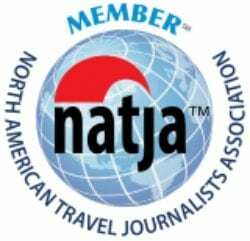 Their concierges can suggest many fantastic restaurants and photo opportunities. We compiled our journey (including the actual route of our ride) in the map below. 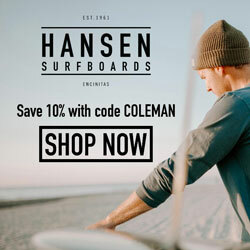 If it doesn’t load right away you might have to refresh the browser, but we think it’s worth it. 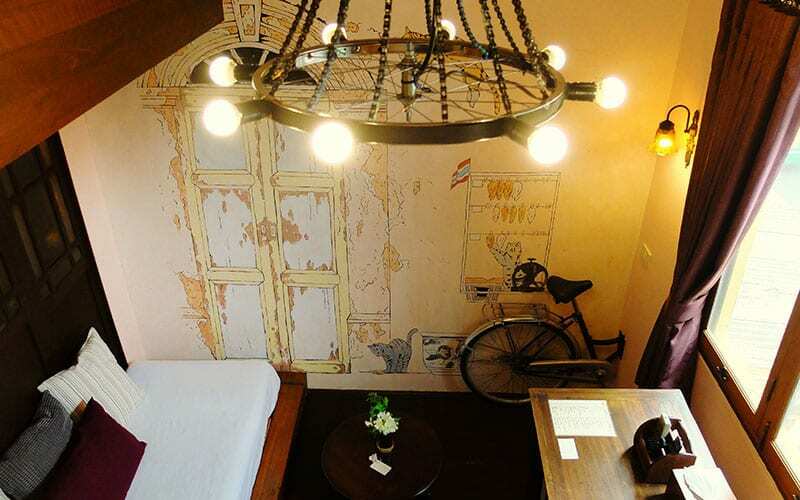 Whether you spend one night in Bangkok, or several, make sure you make room in your itinerary for a stay at the Old Capital Bike Inn. 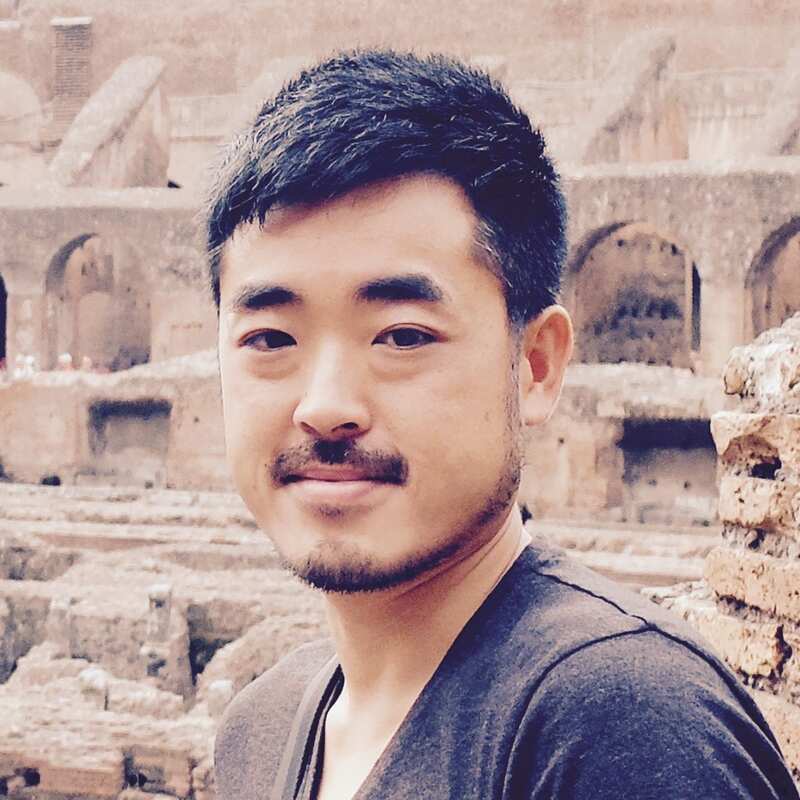 Say hello to Jason and the team, and make sure you include time for at least one bike in Bangkok.